Could tougher voting laws squelch the youth vote? CHICAGO (AP) — Gone are the days when young voters weren't taken seriously. In 2008, they helped propel Barack Obama into the Oval Office, supporting him by a 2-1 margin. But that higher profile also has landed them in the middle of the debate over some state laws that regulate voter registration and how people identify themselves at the polls. Since the last election, Pennsylvania, Kansas, Wisconsin and Texas and other states have tried to limit or ban the use of student IDs as voter identification. 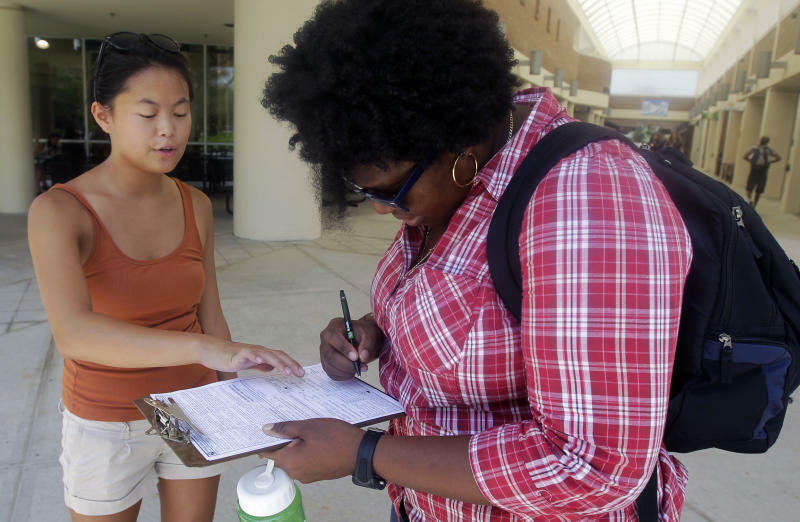 In Florida, lawmakers tried to limit "third party" organizations, including student groups, from registering new voters. Proponents of voter ID and registration laws say the laws are intended to combat voter fraud. The intent, they say, is to make sure people who are voting are who they say they are and have the right to vote. "In this day and age, nothing could be more rational than requiring a photo ID when voters come to the polls," Pennsylvania's senior deputy attorney general, Patrick Cawley, said recently when defending the state's new law in court. Others see these efforts as attempts to squelch the aspirations of the budding young voting bloc and other groups, and they're using that claim to try to get more young people fired up. "You think your vote doesn't matter? Then why are they trying so hard to take it away from you?" asks Heather Smith, president of Rock the Vote, a group that works to register young voters. "It does demonstrate the power they have." Smith notes that it's not just an issue for college students. She was teaching a civics class for graduating seniors at an inner-city high school in Philadelphia this spring and asked how many among them had driver's licenses that could be used, if the Pennsylvania law requiring a photo ID to vote were to survive the legal challenge. "They looked at me like I had two heads," she says. Only two students in the room of 200 raised a hand; few of the students had cars. These are the sort of stories that have led some students to get involved, particularly on college campuses. In Florida, Rock The Vote joined with the League of Women Voters to challenge restrictions on "third party" voter registration. A federal judge said last spring that many of the restrictions made it too difficult for legitimate voter registration organizations to do their work. During the fight, students at the University of Central Florida placed ironing boards around campus, a symbol that they were "pressing the issue." Now, while most college campuses are relatively quiet, some of those students have taken it upon themselves to register their peers during freshman orientation this summer. "We feel like it's up to us," says Anna Eskamani, a 22-year-old graduate student and a leader at the Florida school. In Pennsylvania, when lawmakers were proposing the voter ID law there, 22-year-old Adam Boyer was among students who asked them to reconsider an outright ban on the use of student IDs. "I'd like to think that the proponents of this law weren't trying to disenfranchise certain demographics. I hope it was an oversight on their part, and I think that was the case," says Boyer, a recent graduate of Penn State who plans to attend law school at Villanova this fall. Pennsylvania lawmakers decided to allow "valid" student IDs, meaning they had to have expiration dates. But most colleges and universities in Pennsylvania didn't have such dates on their IDs. So students and other groups that advocate for them have been working with universities in Pennsylvania and states such as Wisconsin to add them. A state judge struck down Wisconsin's voter ID law; that ruling is being appealed. New IDs at institutions such as Penn State, for instance, now have expiration dates. Returning students also can get an expiration sticker to put on their IDs, a common plan at schools that are addressing the ID issue. Joel Weidner, a Penn State official who helps oversee ID policy, says the school is most concerned about out-of-state students who might rely on a student ID to vote if they don't have a Pennsylvania driver's license. Of the 80,000 Penn State students on campuses statewide, he estimates that about 10,000 are from other states. But in many instances, returning students still have to be aware that they need the expiration sticker and know where to get one. "What we don't want to see is a school offering up a change to students but doing it quietly," says Dan Vicuna, staff attorney and campus vote project coordinator at the Fair Elections Legal Network in Washington. "We really hope it will be coupled with a real public awareness campaign." Voter ID and registration aren't the only voting issues on campuses. Long lines and a lack of polling places have been problems for students in past elections, particularly in 2008. So some universities are trying to get polling places on campus. Arizona State is among those that recently approached election officials and got one. "Some have been more receptive to that than others," says Will Klatt, a recent graduate of Ohio University who is now a senior organizer for the Ohio Student Association. In Wisconsin, during a gubernatorial recall election in June, the League of Women Voters received 200 calls from students who said voting requirements caused confusion at the polls. Many, the league said, left without voting. The confusion, in that instance, was over a requirement that Wisconsin voters live in a precinct for 28 days to be eligible to vote there. That's a tricky requirement for students, who are often mobile in the summer months. Last year in Maine, groups such as the American Civil Liberties Union criticized Secretary of State Charlie Summers after he sent letters to out-of state students at four universities telling them they needed to register their vehicles in Maine and get driver's licenses there if they wanted to continue voting in the state. Some saw the move as voter intimidation and a violation of the Voting Rights Act, particularly because Summers found no evidence of voter fraud in an investigation that prompted the letters. Summers' spokeswoman said the secretary of state had consulted with the Maine attorney general and "acted in accordance with all state and federal laws." The U.S. Supreme Court has sided with students on this issue and their ability to vote where they attend school, even when they've come from another state. "So students should be registering in the communities that they feel are home — whether that's their parents' home or their apartment or their dorm room," says Lee Rowland, counsel for the Democracy Program at the Brennan Center for Justice, a nonpartisan legal think tank in New York. "It is a constitutional right to vote." It's not uncommon for out-of-state students to vote where they think their vote has the most impact. So if they attend a school in a swing state, they often vote there. It also can simply just be a matter of convenience, and a way to avoid going through the process of getting an absentee ballot. Right now, Tennessee, Pennsylvania, Kansas, Indiana and Georgia are among states with voter ID requirements in place. Tennessee is the only state that bans use of any student ID. Others limit use to state institutions and/or require proof that the ID is valid, such as the expiration date. Wisconsin, Texas, South Carolina and Virginia are among states where voter ID laws are on hold due to legal challenges. But will young people vote in November in the same numbers as they did in 2008? Eskamani, the grad student in Florida, has noticed a lot of disillusionment among her peers over the economy and a political process they consider "anti-student." "They feel beaten down," says Eskamani. "Instead of more passionate, I think sometimes they feel more frustrated." Some think that frustration could fuel more involvement, especially as students return to campus this fall. "My hope is that (voter ID and other laws) backfire and that young people find out and are annoyed by it — and that it motivates them more to get out and vote," says Tobin Van Ostern, policy manager for Campus Progress, a Washington-based group that works on voting rights and other issues relevant to students. If that happens, Eskamani tells her peers, "WE will determine who the next president of the United States is."